Today’s restorations often overlook curtains, yet no early 20th century interior would have been considered finished without them. Curtains help control light, absorb sound, provide privacy, and add warmth and color, all key ingredients for a homey and welcoming atmosphere. Most period homes had two sets of curtains at each window: a translucent sheer strung against the glass to filter the light, and an outer drape that could be drawn at night for insulation and privacy. 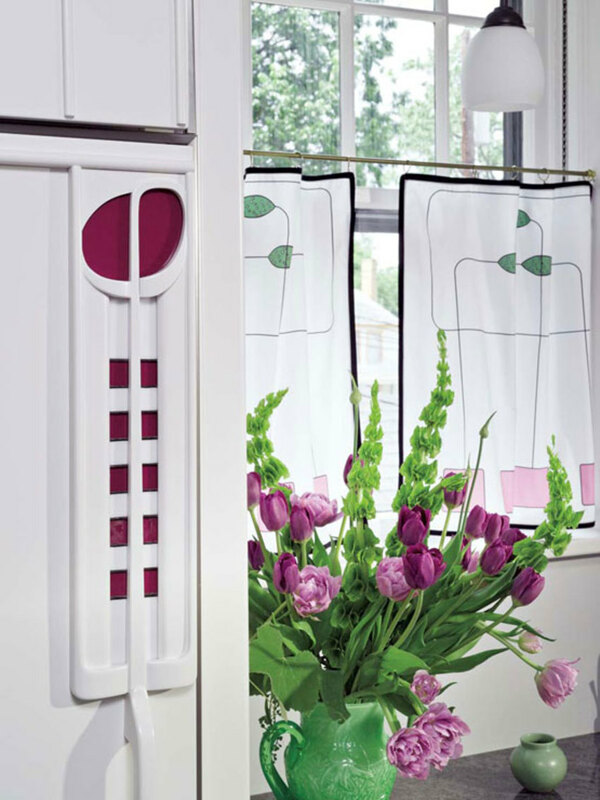 Ring-hung café curtains by Judy Soccio echo the Mackintosh-inspired design of a new kitchen in West Virginia. Photo by Ed Massery. Fabrics used for sheers (or “glass curtains”) were usually simple, an “honest” linen scrim (an open-weave, lightweight linen) or a plain cotton casement that would let in light but still provide a filter; muslin was good for a more informal, cottage appeal. 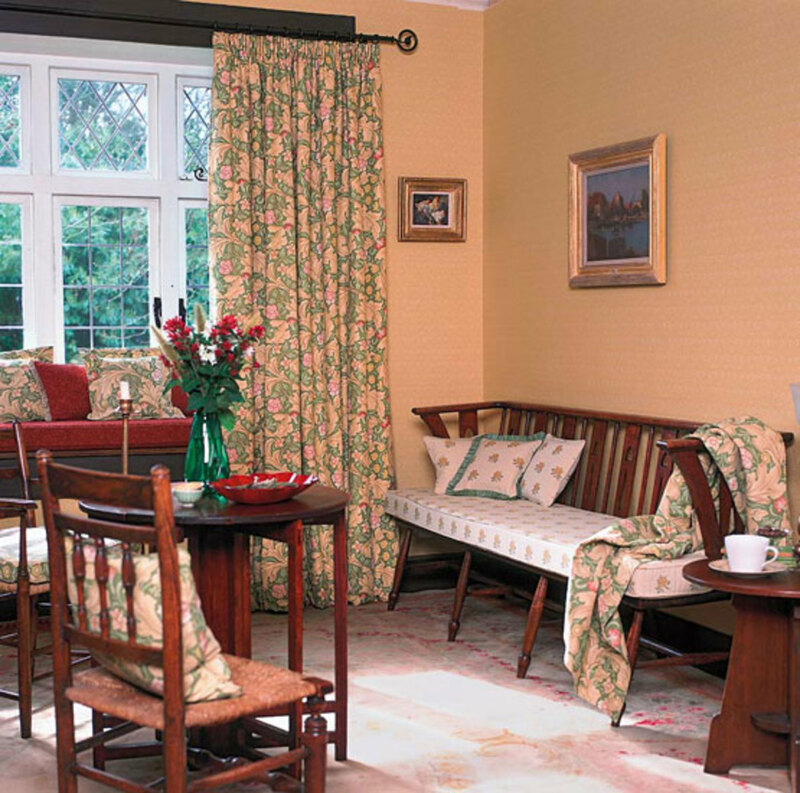 Curtains with decorative borders usually required a more opaque weave. Usually inspired by nature, these borders could be stenciled (with a band of pinecones, perhaps), hand appliquéd (floral designs such as poppies or ginkgo leaves were popular), or, for the more accomplished seamstress, embroidered. 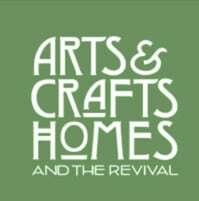 Color was an important consideration, with ivory, ecru, or similar “neutral tones” most common, although Gustav Stickley recommended “corn yellow” or even copper for a warmer glow. 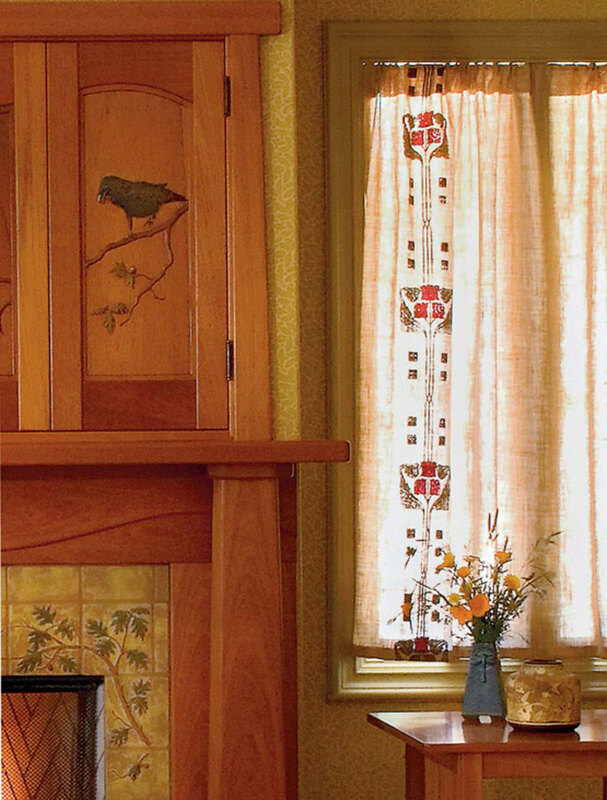 A period design embellishes panels shirred on a pocket rod; curtains by Arts & Crafts Period Textiles. 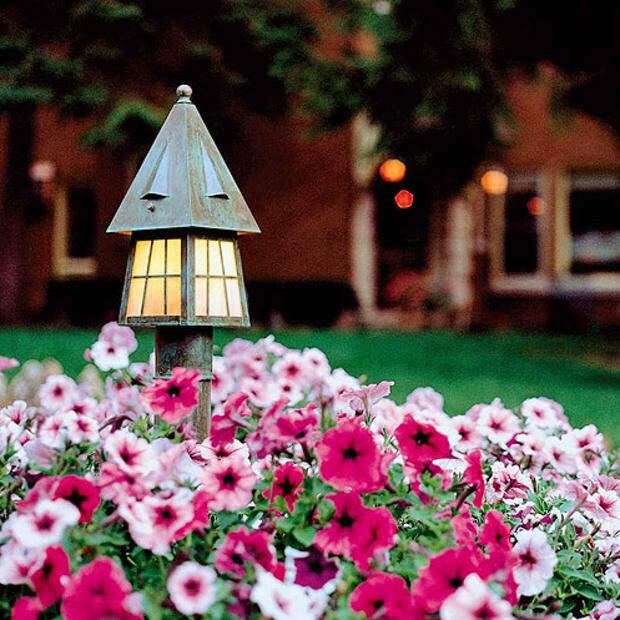 Photo by Nathanael Bennett. Sheers were occasionally designed to mimic stained glass, with colorful patterns intersected by heavy lines to represent leading. Sheers were finished with a simple bottom hem (typically about 2-½") that hung just above the windowsill. Plain brass rings or drapery hooks were sewn onto the back of the fabric, then hung along a brass rod mounted with very basic brackets. (Colorful iron brackets were not seen until the late 1920s, when automobile manufacturers branched out into hardware.) A simple pocket rod could also be sewn across the top of the drape; fabric tabs were not common, probably due to the time involved in their construction. Pleated, ring-hung long panels are made up of Morris’s ‘Leicester’-design fabric, from Morris & Co. by Sanderson. Outer curtains were meant to provide insulation and privacy. Often they were a heavier-weight linen, cotton, or velvet, and more decorative, perhaps printed with a pattern or design. 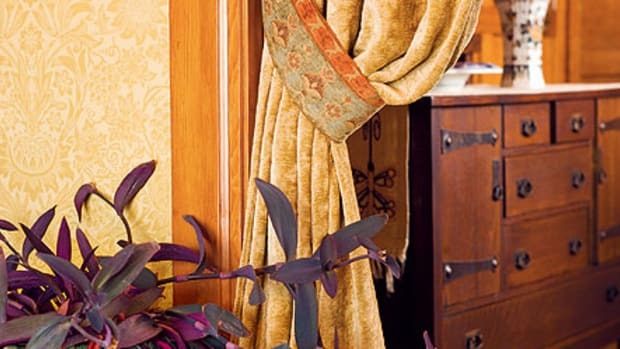 Mounted on brass gooseneck rods with brass rings, outer curtains were not meant to be too full or heavy like their Victorian predecessors: typically just 1-1⁄2 times the width of the window for soft, gentle folds of fabric. Outer curtains were sometimes mounted inside the window frame, especially if there was a decorative element such as a plate rail or frieze on the nearby wall. 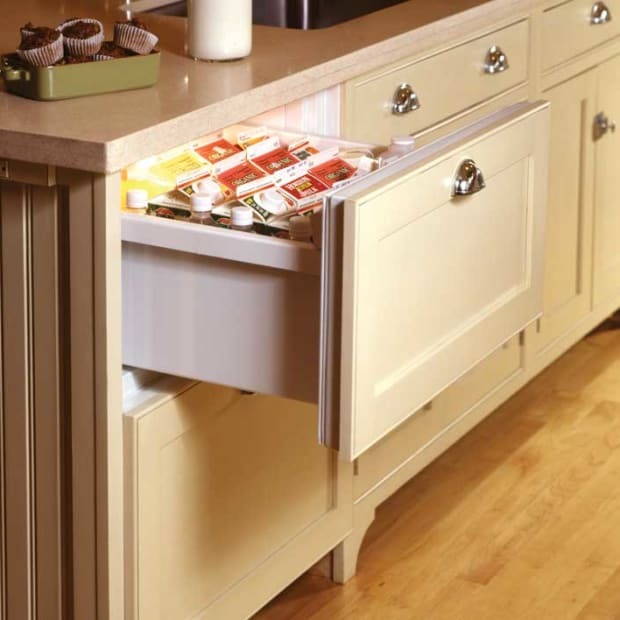 They were usually short, ending in the middle or bottom of the apron below the sill trim. Curtains were not limited to windows. Portieres were often hung across open doorways, or to enclose closets or other utility spaces. Sheer linen curtains were also strung across bookcases to keep off the dust. French doors were also lined with a linen panel—mounted top and bottom to keep it from fluttering or catching in the breeze. 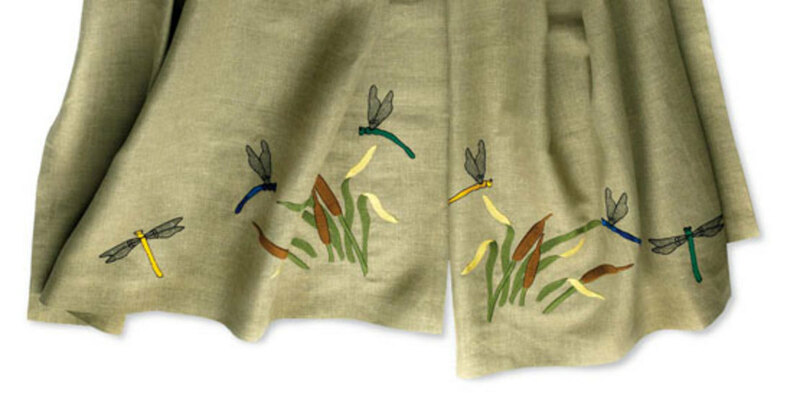 Linen curtains custom-embroidered with a dragonfly and cattail design, by Ford Craftsman Studios. 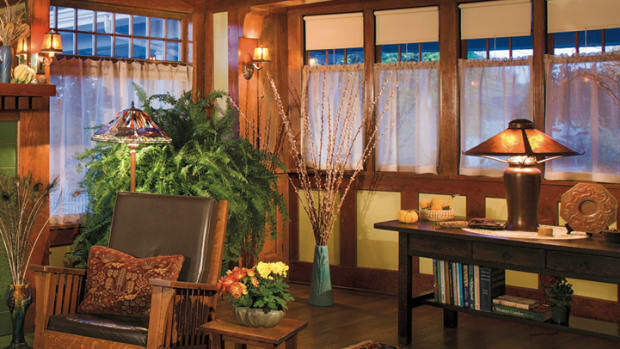 From the turn of the 20th century until the World War II, window treatments moved from Victorian excess through Arts & Crafts simplicity and then settled into classic historical styles. 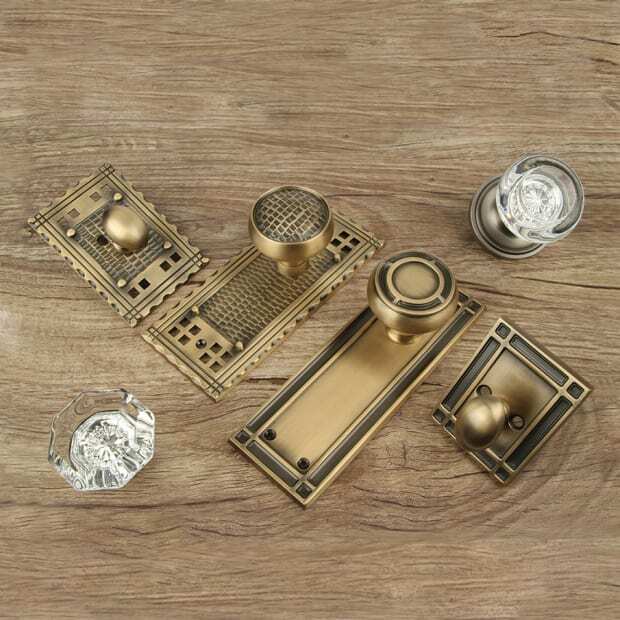 Standard equipment for centuries, fireplace screens, grates, andirons and tools are often seen as merely practical. 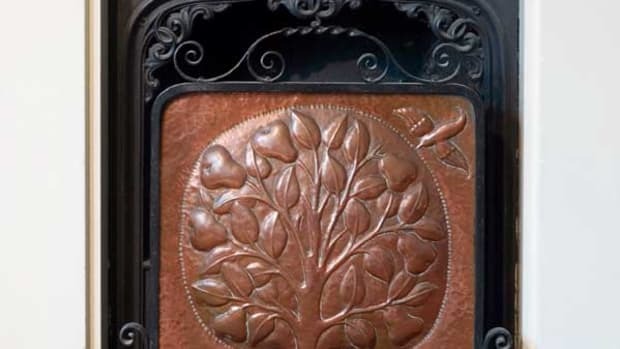 But accessorizing your hearth in period style makes it the decorative focal point in the room.